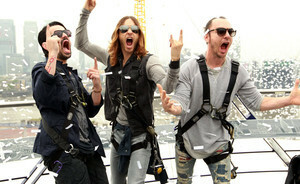 30 Seconds To Mars have been criticized for asking fans to film themselves getting lyrics to the their song 'Do Or Die' tattooed on their bodies in order to appear in a music video for the song. The US band, fronted by actor Jared Leto, posted a message on their website on Tuesday (July 23) asking for help in making a lyric video for the song, which appears on their latest album 'Love, Lust, Faith + Dreams'. Along with the request are a list of things fans must do in order to have their video qualify for consideration, including close-ups of the area tattooed before, during and after the process. All fans must be filmed saying: "I am the Echelon" before going under the needle and must also explain why they are getting it done. Fans have criticised the band for their request, with many of the comments underneath the post describing the move as "irresponsible. "I like the band but I don't think this is a good idea at all," says one commenter, while another adds: "Its absolutely irresponsable and probably the worst thing Mars has ever done." Earlier this year Enter Shikari's Rou Reynolds criticised 30 Seconds To Mars for charging their fans to meet the band after concerts. Posting a link to a blog which explains how Jared Leto and his band charge fans up to £575 to spend time with them before and after they have played live on their forthcoming US tour, Reynolds wrote that the practice is "exploiting" fans and calling it "madness".